The success of Davagh Forest Trails was showcased during the recent visit of the Outdoor Recreation Group for Northern Ireland. The group made up of outdoor recreation experts from within local councils and wide range of other organisations across Northern Ireland was hosted by Sperrins Gateway Landscape Partnership and Mid Ulster District Council at the nearby Shepherd’s Rest. Davagh Forest Trails were launched in 2013 by Mid Ulster District Council (then Cookstown District Council) in April 2013 and comprise of 26.5 km of mountain bike trail and 3kms of walking trail. More recently, a mountain bike pump track and skills park, play park and basic changing facilities have been developed. 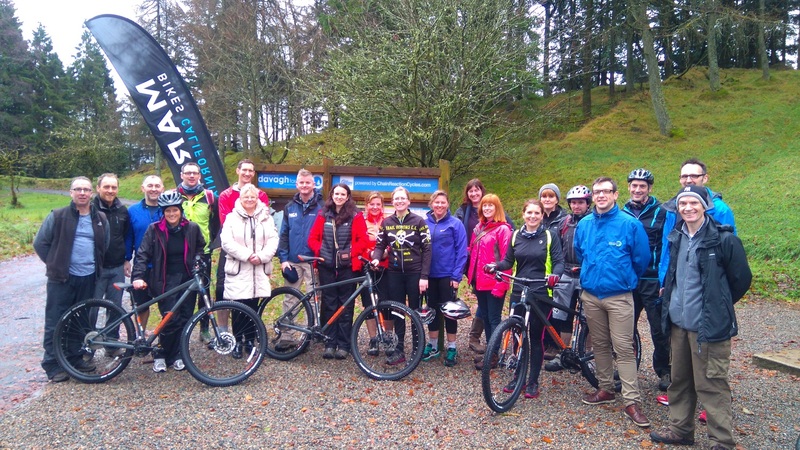 Following an insightful presentation from Mid Ulster District Council on the development, management and promotion of the trails, the group then experienced the trails from the customer’s perspective. Whilst some group members enjoyed the walking trail, others took to bikes provided by official trail provider Outdoor Concepts and ventured onto the mountain bike trails. The group also gained key learnings from the excellent work carried out by Sperrins Gateway Landscape Partnership on the development of Sperrins Walking Trails and Moyola Angling Development. ‘The visit to the Sperrins Area of Outstanding Natural Beauty and in particular the Davagh Forest Trails provided the Outdoor Recreation Group an opportunity to view and discuss best practice with the key people involved in the project. We organised a number of such trips each year view good practice and Davagh certainly didn’t disappoint’ stated Diane Crookes, Product Development Officer, Outdoor Recreation Northern Ireland. The Outdoor Recreation Group is delivered by Outdoor Recreation Northern Ireland on behalf on the Northern Ireland Environment Agency to share best practice by bringing together land managers from public bodies and non governmental organisations with a remit for outdoor recreation access across Northern Ireland.